All Office 365 updates are thoroughly tested and evaluated for performance and scalability before they are released to the public. For significant updates, Office customers are initially notified by the Office 365 public roadmap. As an update gets closer to rolling out, it is communicated through your Office 365 Message Center. The update is then applied to users who have selected First Release. Once it is determined that the feature is ready for broader release, it's applied to everyone else, including people who have selected Standard Release. IMPORTANT: Large or complex updates may take longer than others so that no users are adversely affected. There is no guarantee on the exact timeline of a release. You can change how your organization receives Office 365 updates by following these steps. IMPORTANT: It can take up to 24 hours for the below changes to take effect in Office 365. If you opt out of First Release after enabling it, your users may lose access to features that haven’t reached the scheduled release yet. Navigate to Settings > Organization profile. Next to Release preferences, click Edit. To disable first release, choose Standard release, then click Next, and say Yes to the confirmation. Skip to the last step. To enable first release for all users in your organization, choose First release for everyone, then click Next, and say Yes to the confirmation. Skip to the last step..
To enable first release for some people in your organization, choose First release for selected users, then click Next, and say Yes to the confirmation. Choose Add people to add users individually. Search for their names and click + to Add. When you're done adding users, click Save and then Close. Next to Release preferences, click Actions > + Bulk add people for first release under the Standard release heading. Choose Browse to select a file containing each person's email address. This is similar to how you bulk add users in the admin center. Click Next and then Close. 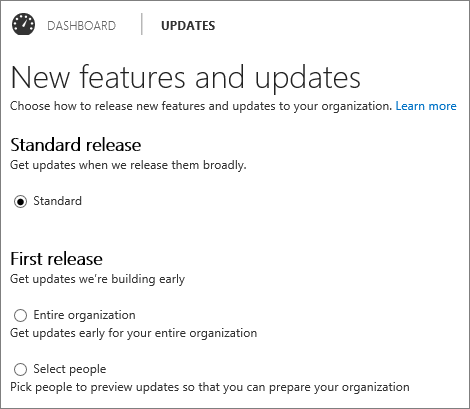 If you're still using the old admin center, you can change how your organization receives Office 365 updates by following these steps. To disable first release, select Standard under the Standard release heading and choose Yes to the confirmation. Then skip to the last step. NOTE: If you don't see this option in your admin center, your subscription will soon be updated with it and you can change the setting then. To enable first release for all users in your organization, choose Entire organization and choose Yes to the confirmation. Then skip to the last step. 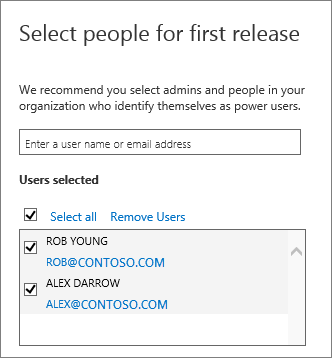 To enable first release for some people in your organization, choose Select people and choose Yes to the confirmation. Choose Pick people to add users individually and then use the people picker to select them for first release. 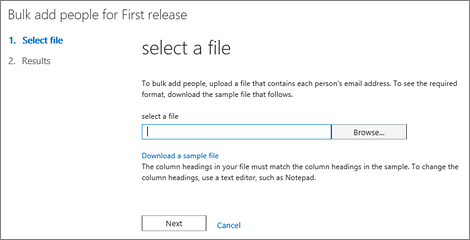 NOTE: First Release Select People applies to Office 365 top navigation, Exchange Online, OneDrive for Business, SharePoint Online and related features (Delve, Video, etc) . Next to Select people, choose Bulk add people. Choose Browse to select a file containing each person's email address. This is similar to how you bulk add users in the admin center.